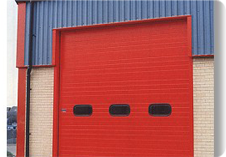 GB sectional overhead doors provide maximum weather resistance, security and insulation. An insulated panelled door made from foam-filled galvanised steel or aluminium panels offering an insulating value of 0.45 W/M.Sq.k. The sectional door benefits over roller shutter doors with its ability to have larger glazed windows or fully glazed panels. Loading Bay, Industrial Units, Retail Units all benefit from this product.